Manta ray at Manta Alley, Komodo Island, Indonesia. Photo by Brandi Mueller. For me, diving is like pizza, it’s always good. But some trips stand out. Sometimes, service goes above and beyond what is expected, and sometimes, the ocean smiles upon you and shares her most amazing secrets with you. Most dive travelers are pretty capable, we don’t need anyone to greet us at the airport and collect our bags from the baggage claim so we don’t even have to lift them. We don’t need the crew to carry our cameras for us into the dinghy or allow us to take scuba kits off in the water and pass them up to preserve our backs. We don’t need someone making us eggs to order for breakfast, or four different options of entrées at lunch and dinner, as I’d happily eat peanut butter and jelly while diving, if that’s all there was. We don’t need laundry service or to get massages on the sundeck after our dives. But, I will admit, all of the above sure are nice. The fantastic service of Siren Fleet started as soon as our little party of divers arrived in Bima on the island of Sumbawa, just a short flight from Bali. We were greeted at the baggage claim and led a short distance to the harbor where a dinghy met us and took us to the beautiful liveaboard, Indo Siren. 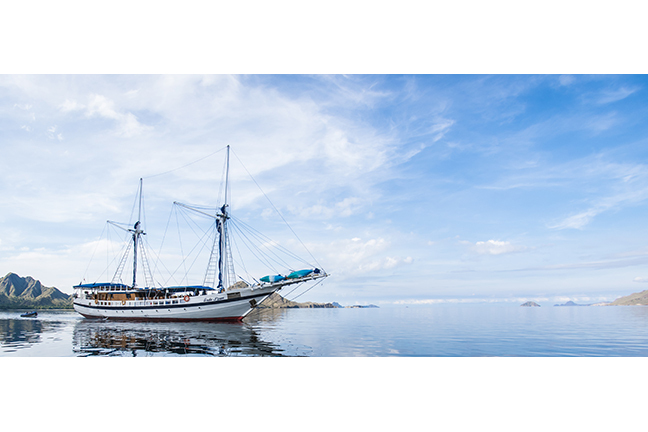 The Indo Siren was built specifically for diving and is a traditional ironwood Indonesian Phinisi sailing ship. The ship takes up to 16 passengers, but we lucked out with only five guests on our trip, with a crew of 15! On board, we spent some time getting to know our home for the next ten nights, including unpacking in our spacious cabins with ensuite bathrooms, and setting up dive gear on the dive deck, which had plenty of space with individual drawers to store things like flashlights and reef hooks and places to hang wetsuits. The indoor lounge had comfy sofas and a large flat screen TV, and the dining area at the stern of the ship was open air, but with the possibility to drop plastic curtains to keep the rain out. My favorite area was the sundeck with lounge chairs, which was a great place to hang out while the boat was transiting. For the photographers, there were several large tables with plenty of charging ports for camera set-up, lens changes and charging. Each diver also got a drawer under the camera table to store chargers and other dry items. After unpacking and exploring, we got settled in for the boat and dive briefing. After a fantastic dinner that promised of more to come, we had a few local Bintang beers and got to know our new shipmates before heading off to bed for an early night. Bonito Reef. The captain and crew were up early, moving the boat northeast to the island of Sangeang. Our first dive was at Bonito Reef, a muck dive that was also our checkout dive. And it turned out to be a pretty amazing checkout dive. One of the muck critters that has eluded me for many years of diving is the mimic octopus. On this dive, I was following our dive guide, Inyo, when he stopped and put his hand up, signaling for me to stop too. I watched him get closer and slowly put his pointer stick out in front of two tiny eyes sticking out of the sand. A few seconds later, a tentacle emerged and touched the stick, checking out what it was, and then there was another tentacle. In a flash, the whole mimic was out on the sand flashing its white and brown stripes, and gliding along the bottom. (I saw this all through my lens as I was snapping away). Back on the boat, I was laughing to myself about how I just checked off a major critter on my wish list… on the first dive! Moving around Sangeang, the water was as flat as a lake. While we were sipping hot tea and coffee, and talking about the first dive, dolphins broke the glass-like waters right next to the boat. Behind the dolphins, we looked up at the volcanic peak on Sangeang, which had small wisps of smoke emerging. The crew reassured us that the volcano was “alive” but not active, and it was "just a little smoke." Hot Rocks. More evidence of the volcano was seen on our second dive at a site called Hot Rocks. Streams of bubbles could actually be seen rising up from the sand and several rocks underwater were hot to the touch. As if just seeing the bubbles rise wasn’t cool enough, there were also large sea fans with longnose hawkfish, brightly colored anthias and two leaf scorpionfish right next to each other. Deep Purple. The dives seemed to get better and better, and our third was at Deep Purple, named for the huge purple sea fans which were numerous. And guess what lives in sea fans? Bargibanti pygmy seahorses. 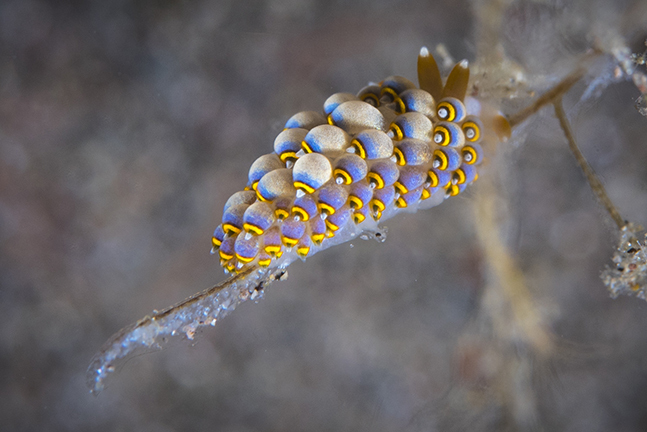 I am always amazed when dive guides point these tiny beauties out because they blend in so well, but our dive guides found tons of them! We also saw blue ribbon eels, in both the black and the blue stages. Stargazer Beach. Our last dive of the day was the night dive. As we pulled away from the Indo Siren in the dinghy, I was taken aback by how dark it was away from the lights of the boat. The moon had not yet risen and there were more stars in the sky than I thought imaginable [POSSIBLE?]. The black outline of the island’s hills sharply contrasted the star-spotted sky, and the Milky Way shone bright, directly above us. Our night dive site was called Stargazer Beach (named after the critter, not the actual stars). But at that moment, I was a stargazer and couldn’t take my eyes off the sky until it was time to back-roll into the inky black waters. I have a theory that once you name a dive site after something, you never see it again; and although they guaranteed me there were plenty of stargazers there, I didn’t see any. It didn’t matter though, because there was plenty of other things to see, including wild-looking corallimorph decorator crabs, flatheads, nudibranchs and tons of huge lionfish, which seemed to sneak up on you and hide right under your stomach. Not a bad ending to a pretty awesome day. Coral Garden. 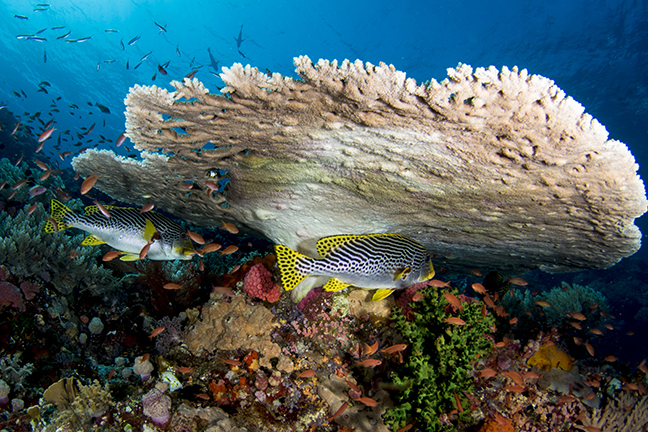 Continuing east, we woke up to the island of Komodo and did our first dive at a site called Coral Garden. Fire dartfish were everywhere, and streams of blue-lined fusiliers swam past us. In the sand, long garden eels emerged to feed on plankton, until we got close and then they lowered themselves back into the sand. Crystal Rock. 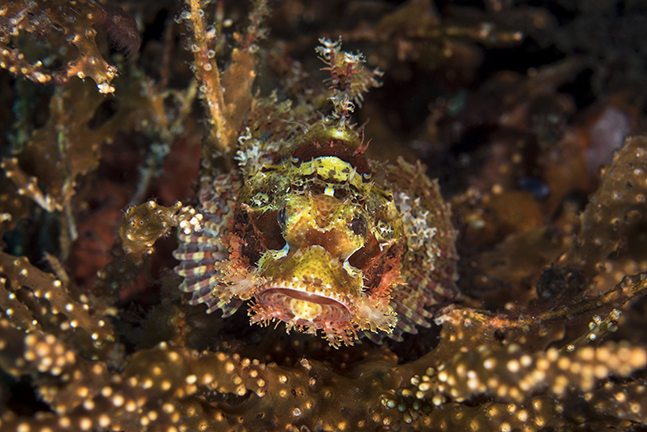 During breakfast, we moved to Gili Lawa Laut, and the second dive was at Crystal Rock where there were lots of hawkfish with large isopods on their heads or tails. I always feel bad for these guys, as having a parasite on you must not be very nice. Shot Gun. Our third dive was a bit of an adrenalin rush called Shot Gun. The dive goes through the pass between Gili Lawa Laut and Gili Lawa Darat, which eventually narrows into a steep canyon filled with fish. The current builds as the canyon narrows and shoots you at high speed through the canyon. At the end of the passage, the current calmed down, and yellow sunbeams were just breaking through the water, giving the reef a peaceful glow after the adventure. Sunset hike. Instead of a night dive, we went for a sunset hike up Gili Lawa Laut and I will admit during the hike, I was wondering what we were doing. This was vacation, no exercise necessary, right? But the view at the top was worth it. Looking down on the green hill islands, with the contrasting sapphire waters of two bays, it was fantastic, as the sun was setting and the sky began to turn orange. Castle Rock. First up was Castle Rock, one of the iconic dive sites of the area, which is a pinnacle subject to strong currents. We back-rolled into the current, reef hooks ready, and it felt as if we had just plunged into fish soup—except it was fast soup. The current was raging, and the fish were swimming just as fast. Huge schools of unicorn fish, jacks and bannerfish rained down on us as larger groupers, tunas and sharks passed through them, as if the current wasn’t even there. Off in the distance, I saw a large shadow, which turned out to be a massive school of batfish that got closer and eventually passed right around me. After each dive, I kept thinking to myself, “How are they going to top that?” And it honestly did just keep getting better and better. After our post-dive hot ginger tea and another fantastic breakfast, we were off to Batu Bulong, which I would rename Anthia Heaven if I could. This area is also known as Current City, and when there is current, the marine life goes off! Batu Bulong. This site is another pinnacle rising from the seafloor, and the entire pinnacle seemed to move constantly, with orange, purple and pink anthias. They coated the reef, and if you got close enough, they would surround you, almost blocking out the light. Sometimes, it was hard to see through them to the reef and the other critters, which included a considerable amount of nudibranchs, eels, lionfish, sweetlips and more. Makassar Reef. Later, we moved to Makassar Reef, one of two famous spots in Komodo for mantas. The current wasn’t quite as strong as the crew wanted (more current means more mantas), so we waited to see if it would change. While waiting, a few of us decided to go for a quick snorkel to check out the current. We got in the dinghy, headed over and dropped in. As we were swimming, I was thinking to myself, what are the odds we would see a manta just aimlessly swimming around this reef? And then, there were four, in a train, moving right past us! The cruise director called us back to the dinghy—it was time to go diving! 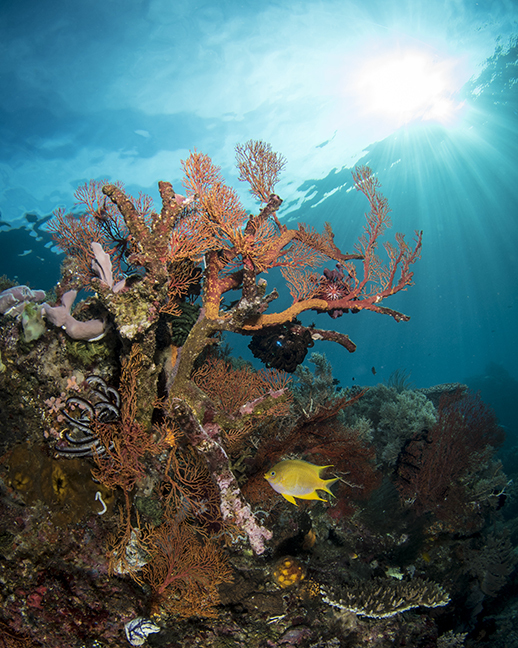 Makassar Reef is a really long dive site, and with a quick current, divers travel a considerable distance during the dive. The current still wasn’t quite strong enough when we jumped in, but it was still like flying over the reef for ages and ages. We only had one manta on the dive (you only need one though, right?) But we also had three turtles, and even some blacktip reef sharks and Napoleon wrasse, and the other group of divers from our boat saw an eagle ray. Seeing Komodo dragons has been on my bucket list since I was in college and read Douglas Adam’s book, “Last Chance to See.” In it, he goes traveling to see several of the rarest and most endangered species on earth. Before that, I had never even heard of the Komodo dragon or knew that they were the largest species of lizards on Earth, weighing up to 70kg (150lb) and growing to three meters (10ft) long. Or that they can run up to 20km/h (12mph) and smell dead meat from up to eight kilometers (5mi) away. There is some scientific controversy over whether or not the Komodo dragon has two glands in the lower jaw that secrete toxins that may be an anticoagulant and cause muscle paralysis or loss of consciousness in their unfortunate prey. This correlates with the theory (which not all scientists agree upon) that Komodo dragon saliva has bacteria in it that increases the likelihood of sepsis in an animal they bite. So the dragon only has to bite its prey and then wait until the prey subsides to sepsis before getting an easy meal. These lovely animals are also cannibalistic. In fact, after hatching, their babies hide in trees for up to two years, so they don’t get eaten by adult dragons, or potentially, their own parents. I was so excited to see them! We took a short dinghy ride from the Indo Siren to the National Park, and park guides gave us a tour to hopefully show us some dragons. With dragon sticks in hand, we only walked for maybe ten minutes and saw the crowd of people before we saw the dragon. I have never seen anything before that looked so prehistoric—like a dinosaur robot on display, but it was real. Constantly sticking its tongue out into the air (smelling us), it hardly moved, and even let park guides take photos of us standing behind the dragons. On the rest of the short walk, we saw one more dragon off the trail, and we also saw several deer—dragon food—roaming around the park. Manta Alley. Back on board the Indo Siren, it was time to dive, and we were headed to the world-famous Manta Alley. We did two dives here, and the current wasn’t as strong as the dive guides wanted, but it was still magical. A manta was right below us when we jumped in, and it swam around us several times as if we weren’t even there. We made our way to about 30m (100ft), where there was a cleaning station. Here, five mantas were doing barrel rolls and coming close to the reef to be cleaned. We stayed there as long as our bottom time would allow and made our way up to the alley-like treadmill. There was not much current, so we headed back to where we started and spent another 20 minutes at about 10m (30ft), with one manta that repeatedly swam around us. Torpedo Alley. After dragons and mantas, it had been a pretty spectacular day, and the boat moved to the southern tip of Rinca Island to an area known as Horseshoe Bay. We did the night dive at a muck site just off the beach called Torpedo Alley, where even more amazing things were to be seen. 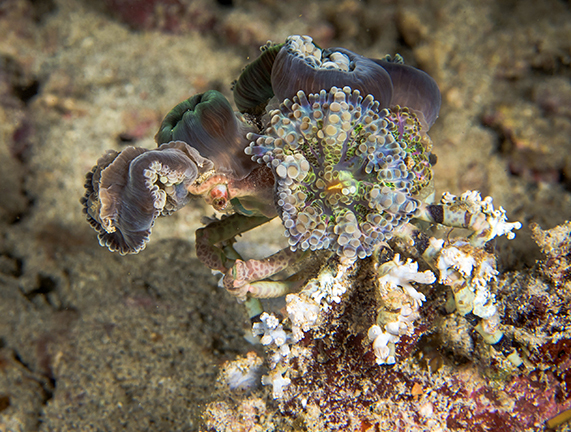 Nudibranchs, orang-utan crabs, and crazy decorator crabs of all colors, were everywhere. And there were bobbit worms! 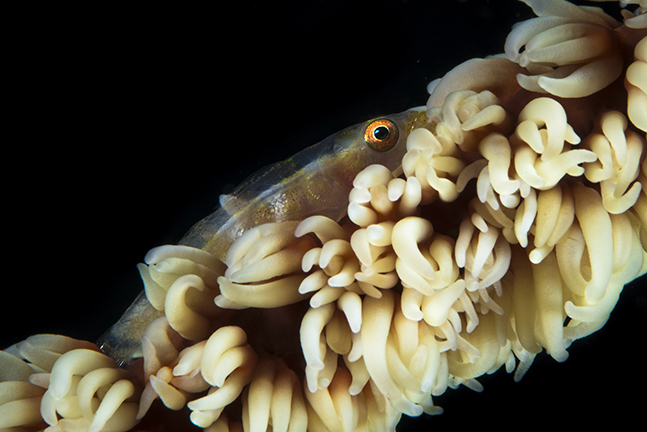 Talk about your creepy nightmare creatures, this worm buries its body (up to 3m or 10ft long!) in the sand except for its antennae and waits for prey to swim directly over it, then it attacks! Its teeth can cut prey in half, and it has toxins which it injects to kill prey much larger than itself. Here were things that go bump in the night—literally. There were bobbit worm antennae sticking up in the sand everywhere! It was a little creepy, but pretty awesome. We woke up to the sun rising and hadn’t yet seen Horseshoe Bay in the daylight. The view from the boat was stunning. We were the only boat in the bay and green hills rose on all sides, with calm blue water below us. We were only a little distance from the black sand beach we had dived the night before. 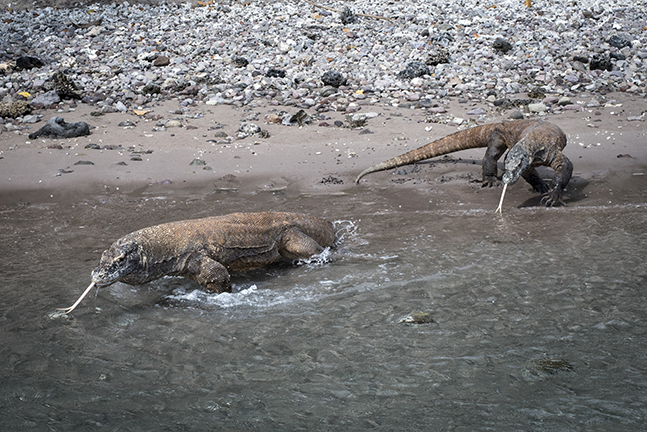 And then I saw what was on the beach—more komodo dragons—right near where we had been diving the night before! (The crew assured me that they do not go in the water unless they are really hungry… Good to know.) As we drank our coffee, we saw three dragons and a few monkeys on the beach. I was still thinking after every dive, “It can’t get any better than this,” and then we saw the dive sites around Horseshoe Bay. It was by far some of the healthiest coral reefs I have ever seen. It was just life upon life upon life, with healthy hard corals, colorful soft corals, thousands of crinoids, sea fans and fish of all colors—everywhere. 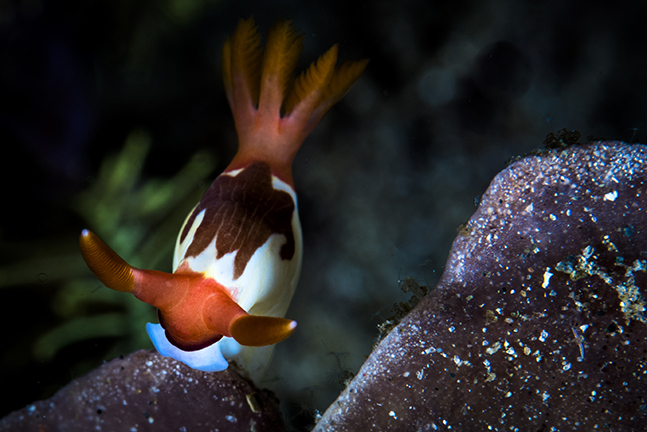 There were nudibranchs, cuttlefish and anemones with clownfish, too. I couldn’t take enough photos, and our 70-minute dives felt like only a few minutes. We visited sites called Boulder, Cannibal Rock, and the Yellow Wall of Texas, which all had beautiful walls covered in life. I even saw the only-found-in-Komodo amphipods, which look like tiny ladybugs but live underwater. 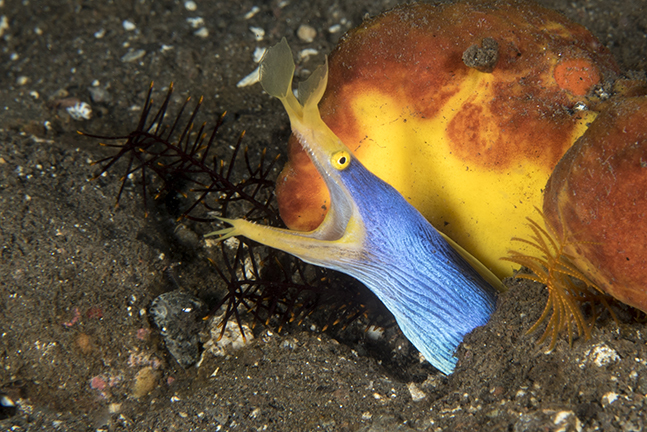 On the night dive, we did another muck beach dive called Rhino Rocks where we saw the cutest little torpedo rays, snake eels, Coleman shrimp and a huge Spanish dancer nudibranch, over a foot long. Rinca Island was as far southeast as we would go on this trip, and the crew left it up to us to choose which sites we would like to revisit on the way back to Bima. We decided to spend another day diving the amazing reefs of Horseshoe Bay. We dived the entrance of the Bay around the island of Nusa Koda, and Cannibal Rock again, as well as Rhino Rocks during the day, and had another awesome night dive at Banana Island. 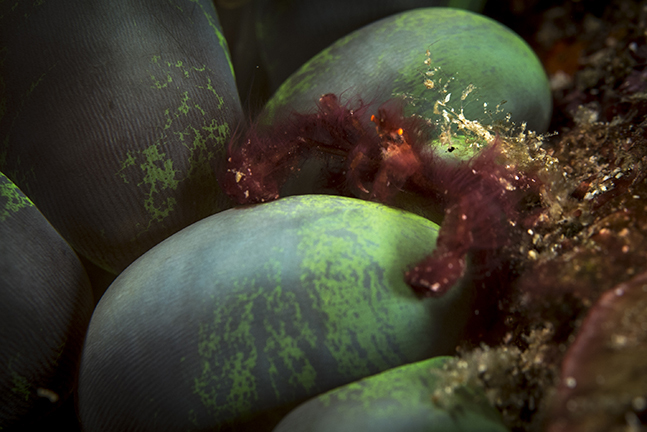 One really cool thing we saw on the night dive was what I think is a Wolf’s pygmy octopus. 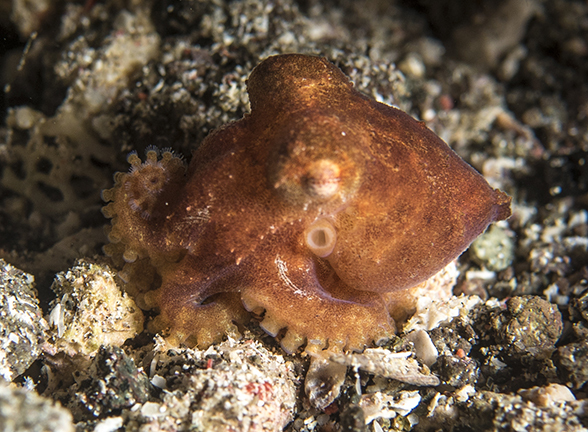 One of the world’s smallest octopuses, it is red in color, and the males have tiny filaments on the last few sucker discs of their arms. It was time to start heading back north and west. We made a unanimous decision to stop at Manta Alley and do two more dives there. 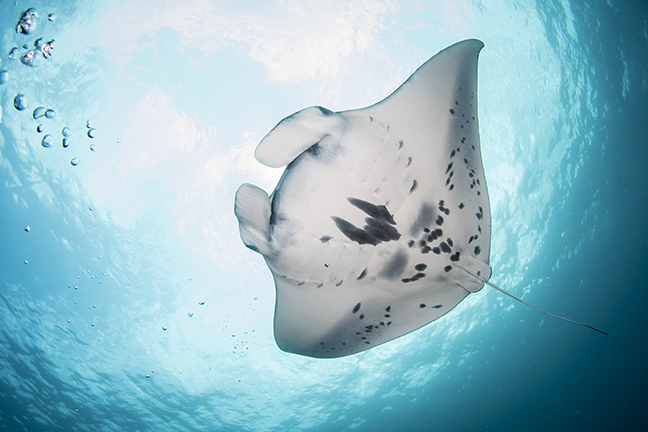 Twelve mantas showed up on both dives this time, and it was spectacular. After that site, we headed to Batu Bolong, and although the current wasn’t strong, we were once again engulfed by brightly colored anthias. 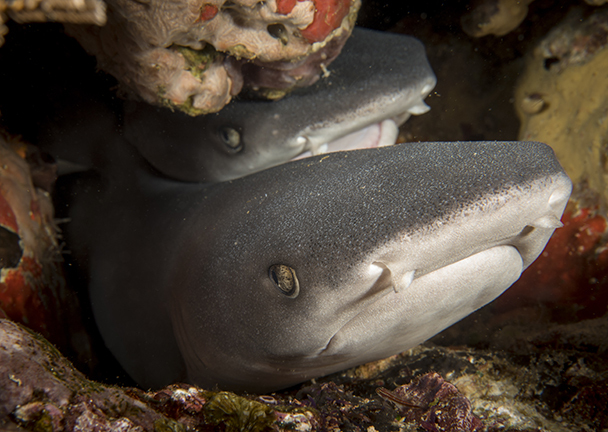 One of the divers even found two baby whitetip sharks, hiding together in a hole—that were just adorable! After a hard day of diving amazing dive sites, we decided to check out a nearby resort to have a few cocktails on the beach—not a bad way to end a day. Golden Passage. It was really nice to be able to go back to our favorite dive sites and do them again. We went back to both Crystal Rock and Castle Rock, and for the third dive, we did Golden Passage, which had some of the strongest current we’d seen. The dive was nice and easy though, just going where the current pushed us, watching the pretty corals and fish go by. I will admit that the perfect weather changed slightly, and we had a little rain on this day. The glassy water had changed to some small waves, which made the boat rock back and forth, with a slight creaking in the wood that made me feel like I was in an old house being rocked to sleep. Tandak Rusa. We couldn’t believe the end of our trip was already upon us, with only two dives left. Back at Gili Banta, we did a dive at Tandak Rusa, which was a sheer wall with sea fans and whip corals jetting off into the blue. Stonefish were everywhere, and I spent a long time photographing an orang-utan crab, which was just in the right place. At the end of the dive, we were doing our safety stop in quite a lot of current, and I kept looking at the dive guide to make sure we weren’t supposed to drift off with it. When I looked towards him, he pointed off into the blue. I turned the other way, and there was a manta, at least two meters across, almost right next to me. I stopped kicking in the current and drifted with the manta for a few minutes before finishing my safety stop and ascending. Gili Banta. Our last dive was also off Gili Banta, and it was a pretty reef upon which we could reflect on our amazing adventure and say goodbye to Komodo. Back on board, the crew took care of everything for us, making sure our gear was washed and dried, while we broke out some local Bingtang beer to relive our trip with our newfound friends and pretended to pack. It has been documented that the region, this year, has been experiencing a severe El Niño event. I was quite worried about diving in the cool waters of southern Komodo and Rinca (usually 18-22°C, July through October). However, for us, the waters were abnormally warm, and I didn’t experience anything colder than 27°C. While I enjoyed diving in only a rash guard, excessively warm temperatures like this are not good for the reef, and we did see evidence of coral bleaching. The crew also noted that some of the critters they usually see were not present. 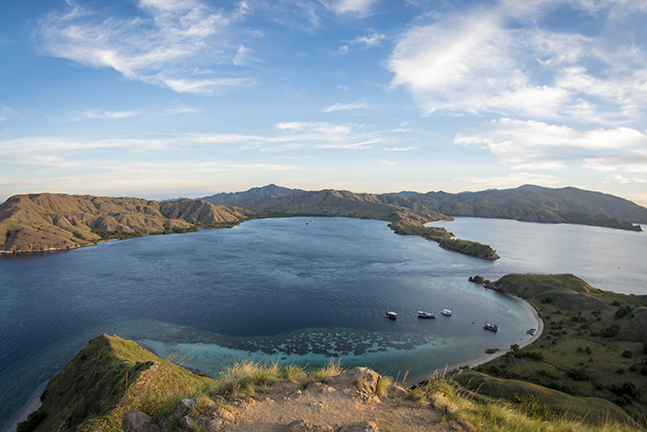 Normally, a 5-7mm wetsuit is recommended for diving Komodo, even though we didn’t experience those cooler temperatures on our trip. 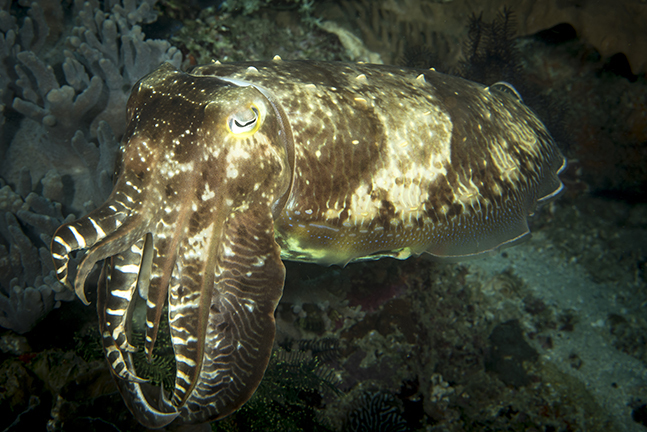 Much of the diving and marine life is also affected by strong currents, making diving difficult but also bringing out the most life—particularly big animals. Stronger currents occur during the new and full moon, and we did not see the strong currents for which the area is usually known. Marine life was still plentiful, and diving was easy, without much current. But I am told there is usually a lot more current than we saw on our dives, and reef hooks are a common accessory most divers usually need to use on a lot of dives. I may have said this once already, but for me, diving is always good. But this was one of those trips where everything fell together perfectly. The boat, the crew, the other guests, amazing diving, good company, and amazing experiences have all led to some pretty fantastic memories. Special thanks goes to Siren Fleet for their generous hospitality and assistance (SirenFleet.com).